The true story of how, in 2001, reporters at the Boston Globe investigated accusations of Catholic priests in Boston molesting children. Following on from leads, interviews with victims, existing court cases and extensive research they reveal decades of abuse. Moreover, they discover that the issue was far wider spread than they at first believed, that senior members of the diocese were aware of the issue and that the church systemically covered up the crimes. 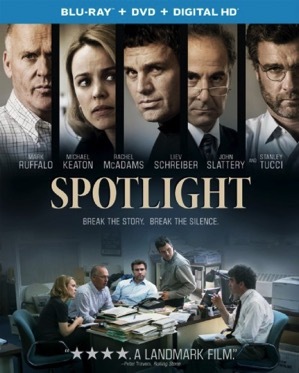 'Spotlight has been compared to 'All the President's Men' for its no-nonsense exploration of the best of investigative journalism. How did they achieve this recognition? Journalistically, how did the Spotlight team succeed when perhaps other investigations did not? To what extent do you think the vow of celibacy is a cause of sexual abuse by priests? Here's a line from the movie: "If it takes a village to raise a child, then it takes a village to abuse one." How do you interpret this observation? With which character(s) do you most identify and why? Some characters like Mike and Sacha share how their professional involvement in the investigation is affecting their spiritual journeys. If they came to you for help, how would you respond? What lessons does this movie give if your desire is to live the way of faith? Skeptics of religion may cite sexual abuse by priests as a good reason to stay away from religious faith. How would you respond to this critique? Which biblical stories or texts does this movie remind you of? Given our current world of sensationalistic news, both on TV and on the Web, is this movie an elegy of a bygone era?